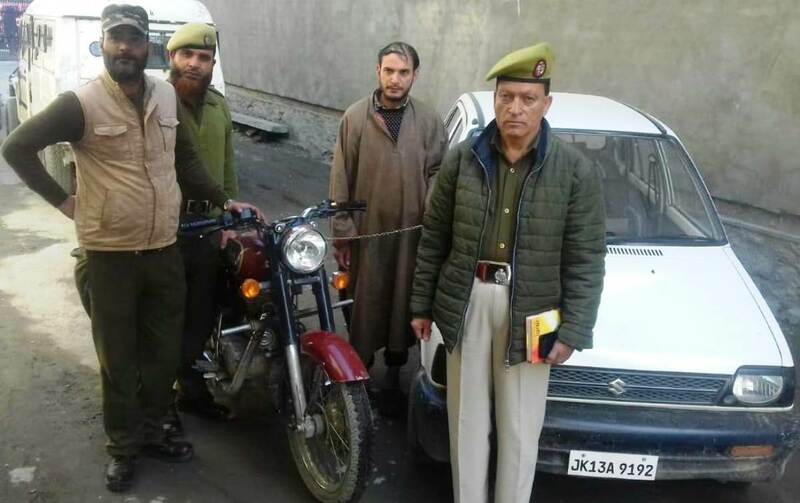 Srinagar: Police on Monday arrested a thief in Srinagar and recovered a stolen Maruti car and a bike from his possession. The spokesman said that a written complaint was lodged by Irfan Ahmad Ganie, son of Abdul Qayoom Ganie, a resident of Yari-Kalan Chadoora in Police Station Karan Nagar stating that one individual was trying to steal his Maruti 800 car at Karan Nagar. Accordingly, a case FIR No. 16/2019 under relevant sections of law was registered and an investigation was initiated. During the investigation, one suspect person namely Abdul Hamid Mir, son of Abdul Rahim Mir, a resident of Rawal Pora Budgam was apprehended and from his possession, one Maruti car, one bike, two master keys and a wooden scale was recovered. Police added that further investigations are going on and more arrests and recoveries are expected. Meanwhile, a drug peddler identified as Aamir Akbar Mir son of Mohammad Akbar Mir resident of Mumkak Sopore was arrested by the police. Fifty 50 bottles of Maxcoff, Codeine P Coff-T and Codeine Apdyl-T were recovered from his possession. In this regard, a case FIR No 18/2019 under relevant sections of law has been registered in Police Station Tarzoo.